Our Custom Pages feature lets you create static pages and configure its content. 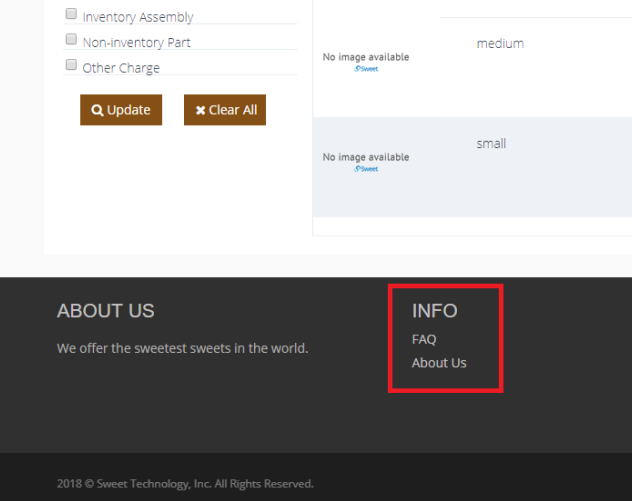 You may add custom content pages like "About Us" and "FAQs" to your B2B portal. In this way, your customers can have access to those pages to learn more about your business. In order to have access to this feature in Sweet, you must also use the custom domain feature. Click on Configurations -> Custom Pages. 2. Click on +New Page. 3. Fill-up the information needed. All field with asterisks are required. Body - this is the content of your page. You may customize the font style, size, color, etc. 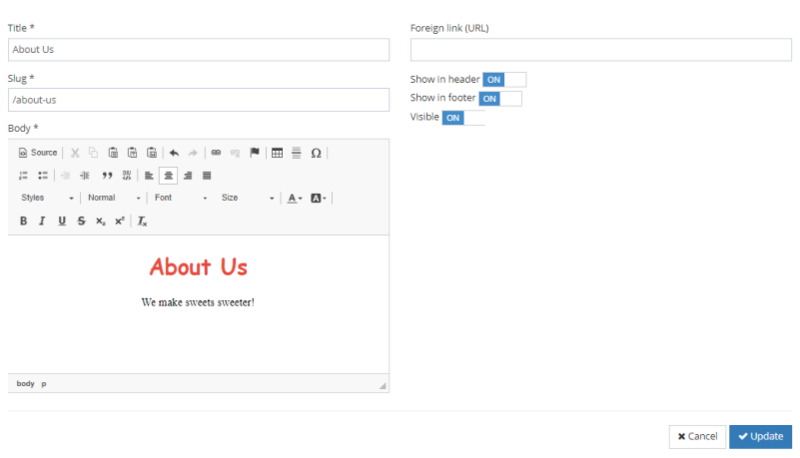 Foreign Link (URL) - this is where you can put the link of your pages outside of Sweet. For example, if you have a separate webpage that you want your customers to view. Visible - this switch will let you choose whether you want the link to be visible/active or not. 4. Click on Update at the bottom of the page to save changes. The links will show up below the Announcement bar on your B2B portal when you turn "Show in Header" on. They will show up at the bottom of the page under INFO when you have "Show in Footer" on. Once your customers click on the link, they will see the pages below.